Definition Sitting height is the distance from the top of the head to the buttocks when a sitting position. Landmarks Measure from the top of the head to the bottom of the thighs (surface on which the patient is sitting) (Fig. 4.15b,c). Instruments Sitting height table or stadiometer. Position The patients sits straight, eyes looking straight ahead (Frankfort horizontal plane). The back of the head, back, buttocks, and the shoulders are in contact with the vertical board. A moveable headboard is used to adjust the measurement (Fig. 4.15b,c). Alternatives The patient sits at the door jamb with the legs straight out in front, the back of the head, shoulders, and buttocks are in contact with the wall. A ruler or book can be used instead of a headboard. Measurements are taken with a tape from the floor to a marking on the door jamb (Fig. 4.15d). Remarks The charts from birth to 16 years are provided in Figs. 4.16-4.18. Figure 4.16 Crown-rump length at birth, both sexes. From Merlob et al. (1986), by permission. Figure 4.17 Crown-rump length and sitting height, males, birth to 16 years. From Tanner (1978), by permission. 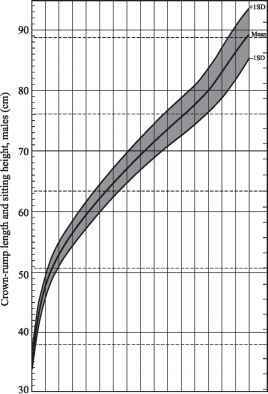 Figure 4.18 Crown-rump length and sitting height, females, birth to 16 years. From Tanner (1978), by permission. Definition Sum of parental heights divided by 2. Remarks Mid-parental height is an important parameter in children who appear to be smaller or taller than average. There is an almost linear correlation between height of children 2-9 years and the heights of their biological parents. 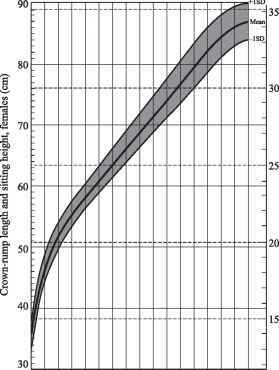 Using mid-parental height, projections can be made of the child's growth centile using the combination curve of Tanner (Figs. 4.19,4.20). Look up the child's height at the left margin (73-100 cm) or at the upper margin (101-150 cm). 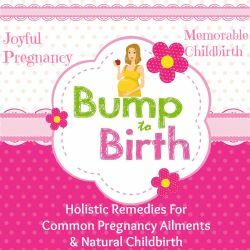 • Follow the curved line from the left border of the chart until you cross the line for the child's age. 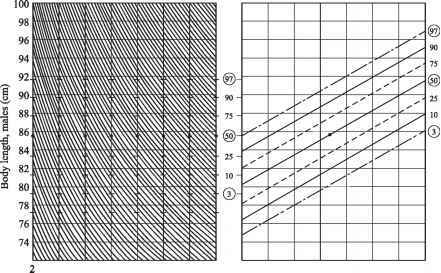 • Then draw a horizontal line to the second chart until you meet the vertical line coming from mid-parental height. • Find the percentile of the child's height along the right-hand margin in relation to the parents' mid-parental height. Example A 6-year-old boy has a height of 110 cm, his parents (mother, 165 cm; father, 175 cm) have a mid-parental height of 170 cm. He is on the 10th percentile for expected height in view of his mid-parental height. 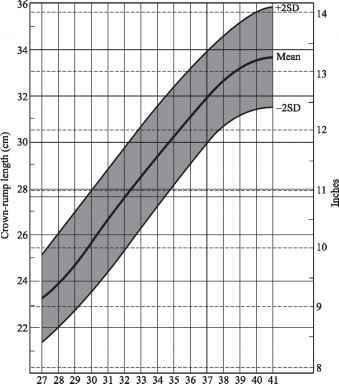 Figure 4.19 Mid-parental height, males, combination curve. From Tanner et al. (1970), by permission. What is the right size of a boy head circumference age 12 years old? What is the height between back and head when sitting? What is the circumference of a 6 year old boy? How to use a sitting stadiometer?